Basque Country is an autonomous region in northern Spain on the Atlantic coast near the border with France. It is home to the Basque people, an ancient ethnic group with significant national aspirations. About 2.1 million people live in Basque Country, which is devided into the three smaller regions of Guipúzcoa, Biscaja and Álava. The capital of the autonomous region is the city of Vitoria-Gasteiz. The oldest remains discovered in the Basque Country are made of stone, dating from the Paleotlithic period (150,000 before Christ). The Neolithic period (4,500 to 2,500 BC) brought about a major change in people`s lifestyle: the inhabitants built settlements and began to farm the land and raise livestock. In ancient times, today's Euskal Herria and adjacent areas were inhabited by ancestors of Basques who the Greek historian Strabon considered savages and warriors. The land of Vascones became a kingdom in the ninth century when the nobles chose Iñigo (824-852) from the Aritza dynasty as king. The kingdom underwent many changes over the next few centuries under Castilian King Ferninand the Catholic invaded and subdued by arms peninsular Navarre Kingdom in 1512. From the 12th to the 15th centuries villas(towns) and cities emerged, also with their own local fueros or charters and rights granted by kings. It was during this period tha the so-called "foral territories" were created and agreements reached with the king, by which he would have authority over the land in exchange for respecting the territorial self-governments or fueros and rights. The 19th century is characterised by a gradual loss of rights for the Basque people. The Kingdom of Navarre was incorporated as another province in Spain and the other three provinces of the south refused to become a single province, and therefore retained provisional status. In the late 19th century new ideologies and political movements came into existence, such as socialism but especially Basque nationalism for the restoration of the rights and privileges of the Basque people, as did labour unions. The first 3 decades of the 20th century came a flurry of political activity, followed by the military uprising led by Franco and a long civil war (1936-1939). In 1936 the Spanish Congress (Cortes españolas) passed the Basque Statute of Autonomy and Euskadi reestablished its self-government that had been demanding since the abolition of the rights and fueros. The entire Basque Country fell to Franco´s troops in July of 1937. The Franco dictatorship (1939 to 1975) was a dark chapter. As the Basque country had been among the centers of anti-Franco activity and the Basque language was seen as a threat for Franco's vision of Spain, Basque cultural expressions, including the language was suppressed. In part as a reaction to that, ETA (Euskadi ta Askatasuna; "Basque country and freedom") formed to violently oppose first the Franco regime and then its democratic successors and fight for an independent Basque country. While the violence has mostly subsided in the 21st century, open wounds still remain, especially since even the democratic governments of the 1980s used some extra-legal measures in fighting ETA. Álava (Basque Araba), capital Vitoria-Gasteiz. Biscay (Spanish Vizcaya, Basque Bizkaia), capital Bilbao-Bilbo. Gipuzkoa (Spanish Guipúzcoa), capital Donostia-San Sebastián. Atlantic Basin - Formed by many valleys with short rivers that flow from the mountains to the Bay of Biscay, like the Nervión, Urola or Oria. The coast is rough, with high cliffs and small inlets. 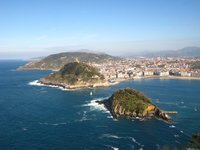 The main features of the coast are the Bilbao Abra Bay and the Estuary of Bilbao, the Urdaibai estuary and the Bidasoa-Txingudi Bay that forms the border with France. Middle section - Between the two mountain ranges, the area is occupied mainly by a high plateau called Llanada Alavesa (the Álava Plains), where the capital Vitoria-Gasteiz is located. The rivers flow south from the mountains to the Ebro River. The main rivers are the Zadorra River and Bayas River. Ebro Valley - From the southern mountains to the Ebro is the so-called Rioja Alavesa, which shares the Mediterranean characteristics of other Ebro Valley zones. Some of Spain's production of Rioja wine takes place here. Bilbao (Bilbo) is the largest city and capital of the region of Vizcaja (Biscay|Bizcaia). San Sebastian (Donostia) capital of the region of Guipúzcoa (Gipuzkoa). Vitoria (Vitoria-Gasteiz) capital of the region of Álava (Arabe), and the capital of the autonomous region of Basque Country. One of the top attractions of the Basque Country is the Guggenheim in Bilbao. The museum is a museum for modern and contemporary art. The architecture of the museum itself, can be classified as just being that. The design of architect Frank Gehry was opened in 1997 and lies along the river Nervion right in the center of Bilbao. The museum can be reach by tram there is a stop (Guggenheim) a 100 metres from the museum. The nearest metro station is Moyúa. By bus you can reach the Guggenheim on line 18. Alava, along with its neighbor La Rioja, on the other bank of the Ebro River, produces world-class wines and is especially famous for its robust reds. Situated in the foothills of the Pyrenees Mountains, Alava offers an easy rolling landscape, mild climate and vineyards everywhere. It is an ideal place for wineries to multiply, spread, consolidate and, in the process, amass large quantities of money for their owners. As these fortunes grow, new brands need to be created and fresh images must be marketed. One way some wineries achieve this is by using avant-garde architecture for the construction of their buildings. In the little town of Elciego, the Marques de Riscal winery has one of these futuristic buildings designed by world-famous architect Frank Gehry (he also designed the Guggenheim Museum in Bilbao, a hundred miles or so to the north). This time, however, he "pushed the envelope" (so to speak) of the Guggenheim style. He made the Guggenheim convoluted shapes flow more freely as if a storm were blowing on the outer surfaces and making them flap like flags in the wind. The result is absolutely astonishing. The sole purpose for the edifice is to be a temple to Bacchus, the god of wine! A few miles away, just outside Laguardia, another famous architect by the name of Santiago Calatrava recently created the Isios winery. (He also designed the new Olympic stadium in Athens, Greece, and the ultra-modern City of Arts and Sciences/Performing Arts Center, in Valencia, Spain) Although not as much "out-on-the-edge" as the Marques de Riscal winery, its soaring, wavy roof set against the backdrop of the blue sky and the green mountain range is a sight to see. The industrialist Solomon R. Guggenheim was inspired by Baroness Hilla Rebay von Ehrenwiesen's love for modern art. Rebay laid more emphasis on art that is non-objective. Guggenheim is known for his debates on abstract art with Robert Delaunay, Albert Gleizes, and Wassily Kandinsky. Kandinsky's Composition 8 was purchased by Guggenheim, which made the entire collection famous. The Clasica San Sebastian is a cycling event that takes place in August, just after the Tour de France. Since the first race in 1981, the race has been moved around on the cycling calender and for now has landed in August. It is part of the UCI World Cup. As the Basque Country is a mountainous region, the race is suited for climbers and the list of winners has some big names, including Miguel Indurain, Gianni Bugno and Paolo Bettini. More than once the race was decided on climb of the Jaizkibel, which lies about 27 kilometres from the finish line. Jazzaldia is a 5-day jazz festival that takes place in San Sebastian in the second part of July. The festival takes place at different venues, including the Teater Vitoria Eugenia, the Auditorium of the Kursaal and on the Plaza de la Trinidad, but also in smaller clubs and bars. Besides jazz there is also room for some other genres of music. Without a doubt, this is the loudest festival in Spain for its Tamborrada, costumed drummers who wind through San Sebastian. Held every January in the historic town, it’s a two-part event beginning at midnight with an all-night and all-day parade, coupled with unofficial public drumming supplemented by street parties, food and drink, ensuring no-one gets any sleep. The Basque mountains form the watershed and also mark the distinct climatic areas of the Basque Country: The northern valleys, in Biscay and Gipuzkoa and also the valley of Ayala in Álava, are part of Green Spain, where the oceanic climate is predominant, with its wet weather all year round and moderate temperatures. Precipitation average is about 1,200 mm. If you can't find flights into Bilbao, an alternative can be to fly into nearby Santander in Cantabria, and take the train or bus from there to Basque Country. Daily connections to main cities from Paris, Madrid and Barcelona. The motorway between Paris and Madrid goes through Baiona/Bayonne, Donostia/San Sebastian and Vitoria/Gasteiz. The tolls between Baiona and Donostia are pretty expensive. Another motorway links Iruña/Pamplona with Barcelona There are motorways between all the main cities: Bilbo-Gasteiz, Bilbo-Donostia, Donostia-Iruña, Gasteiz-Iruña. Daily connections with Madrid and Barcelona from Bilbo/Bilbao, Donostia/San Sebastian, Gasteiz/Vitoria and Iruña/Pamplona. There is an extensive train network. The roads are well signposted, but watch out for occasional monolingual signs in Basque. There is an extensive bus network. The official languages of the Spanish region are Basque (Euskara) and Spanish. Spanish is the most widely spoken language, but there are Basque speakers as well. Practically everyone speaks fluent Spanish and Spanish is the language of choice in the larger cities like Bilbao, Vitoria-Gasteiz or San Sebastian, while Basque is more spoken in the countryside and again, most are bilingual in Basque and Spanish. 700,000 out of the Basque country's population of 2,100,000 speak Basque. From the region's location, you might expect this language to be a blend of Spanish and French, but Basque is unrelated to either of them, and in fact seems to be unrelated to any other known language. Txakoli: white wine from the regions of Bizkaia and Gipuzkoa, also now produced in a part of Araba/Alava. Rioja wines: produced in La Rioja, south of Araba/Alava and southwest of Nafarroa/Navarra. Cider (Sagardoa in basque): is not like British or Nordic cider, it doesn't have gas and is more similar to the wine. Is mostly produced in Gipuzkoa around Donostia/San Sebastian but also in some parts of Nafarroa/Navarra and Bizkaia. In winter between January and March the cider cellars are open as restaurants where you can have dinner and you drink all the cider you want. Kalimotxo: low quality wine with coke. Typical drink of teenagers and for parties. Patxaran: sloe liquor. Typical after dinner. Tastes a bit like the cough medicine 'Night Nurse'. Beer: if you want a tap beer (normally cheaper) you can ask caña or half caña called zurito. Normally the glass is not filled to the top and depending on the place, the barman or your face it could be a big or small measure. This is version 22. Last edited at 10:43 on Mar 6, 19 by Utrecht. 17 articles link to this page.